We’d love your help. Let us know what’s wrong with this preview of The Sacred Tradition of Yoga by Shankaranarayana Jois. To ask other readers questions about The Sacred Tradition of Yoga, please sign up. The Sacred Tradition of Yoga is a precious collection of teachings that open the door to the heart. Savor each chapter and read it again and again! Inspiring and practical, it is a valuable resource to lean into on the spiritual path. By illuminating ancient yogic teachings in clear and beautiful prose, Jois points the way to the Truth. This book is beautifully written, and holds a wealth of truly inspiring, insightful and deeply penetrating teachings on yoga. I can not recommend it enough. It's a perfectly fine book for laying out the principles of yoga (though I have read better), but the "Modern Spiritual Life" part of the title is a complete misnomer. The modern experience was only referenced when it was easily connected, but there was no effort to take a look at the issues of modern life and then detailing how yoga principles could be used to address these concerns, which is what I thought I'd be getting when I purchased this book. As a yoga teacher and yoga practitioner I keep coming back to this book time and time again. It is an excellent reference book which I use to prepare for retreats, classes and general guidance with students & clients. It is a heart inspired book; a great introduction for the seeker, and a gem for the mature practitioner. The nuggets of truth lie hidden in the many layers of our consciousness waiting to be revealed upon further inquiry. I have been studying yoga with Dr. Jois for several years As a yoga teacher and yoga practitioner I keep coming back to this book time and time again. It is an excellent reference book which I use to prepare for retreats, classes and general guidance with students & clients. I have been studying yoga with Dr. Jois for several years and together with the support of the Sadvidya Foundation(@www.sadvidyafoundation.org). have been able to incorporate these yogic practices into my life(especially Meditation and Proper use of Food). The rewards have been immense -a deeper faith, peace of mind and simpler lifestyle -bringing more harmony in relationships with family and community. If you want to know the true meaning of yoga, this book is essential in broadening your understanding. The satisfaction comes from going back - always inspiring and relevant. 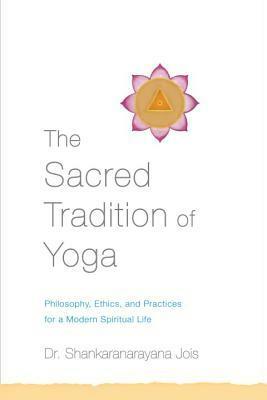 The Sacred Tradition of Yoga is a beautifully written book that illustrates a way forward for those of us longing to be in touch with our true nature and live a yogic lifestyle. I have given this book as a gift many times and I recommend it to any and all who are looking for a resource to support their practice. Since reading this book, and applying the practical tools that Dr. Jois shares, I have experienced more Balance, Contentment, Peace, and Joy in my day to day life. Dr. Jois lays out a map, to guide the reader into the inner equanimity of the Heart. Given to me by my yoga teacher as it was written by his teacher. Very well written and organized. Great intro book to Yogic philosophy basics. I was impressed with how un-PC much of it was. Also fascinating to compare many aspects to Judaism. A beautiful explanation of the teachings/philosophy of yoga. I read a little every day after my asana practice so it took a long time to finish the book. This turned out to be a good way to cover the different ideas by letting them sink in. However, these lovely thoughts are so hard to put into use in the modern world and the book does not really give any suggestions on how to do this. Still worth reading and referring back to.